Born in Edenton, North Carolina, around 1784, James Bivings trained as a medical doctor and relocated to Lincolnton, NC. During 1818/19, he apparently became interested in the Michael Schenck cotton mill  the first in the state. Bivings and John Hoke partnered with Michael Schenck to relocate and dramatically expand his mill. 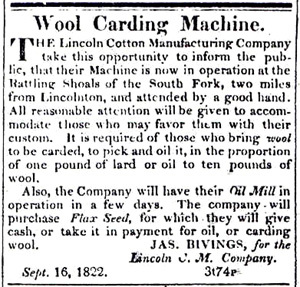 The new Lincoln or Lincolnton Cotton Mill was built in 1819 on the South Fork of the Catawba River with probably 512 spindles, compared to the 150 - 154 spindles in the first Schenck mill. The mill was financially successful and was expanded. 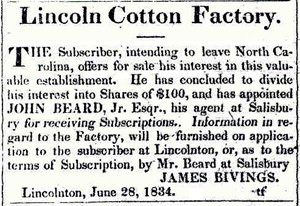 James Bivings had an active role in the new enterprise, serving as the agent for the mill in dealing with merchants and clients, according to existing newspaper ads of the period. 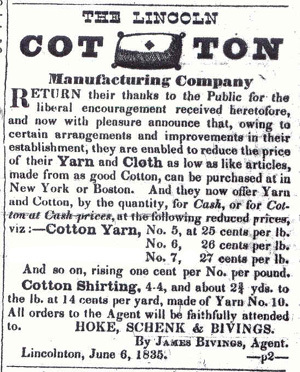 Bivings and Schenck sold out their interests in the Lincolnton Cotton Mill around 1835 to John Hoke, although the firm continued to be listed during that year as Hoke, Schenk & Bivings. While Michael Schenck retired from business life, Bivings relocated to South Carolina to build another cotton mill in what would initally be known as Bivingsville. Bivings bought land near Spartanburg around 1832. At some point, he formed the Bivingsville Cotton Manufacturing Company. The textile mill was operational by 1836. The new cotton mill had 1,200 spindles (approx.) and 24 looms, with an overshot water wheel that was 26 ft. in diameter and 12 ft. wide. The mill operated successfully for some time, but economic depressions (or panics) and increased competition resulted in the mill being sold in bankruptcy proceedings in 1856 for $19,500. The group that bought the mill included J. Bomar, $5,000 (stock subscription); Simpson Bobo, $2, 500; S. N. Evins, $2,500; Vardry McBee, $5,000; J. C. Zimmerman, $2,500; D.E. Converse, $1, 500. The new company, John Bomar and Co., operated under that name until Bomar died. Dexter Edgar Converse served as the manager of the mill. After the Civil War, Converse became the principal owner of the property. Dr. James Bivings died near Crawfordsville, SC, on August 18, 1869.